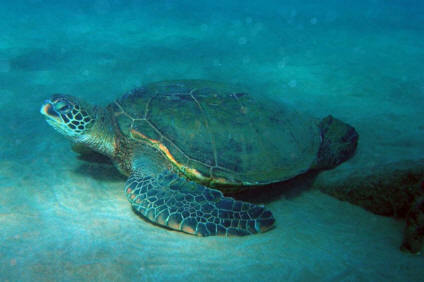 The Green Sea Turtle is the largest hard-shelled sea turtle. Adult shell color varies from grey to green or even brown. Often, shells have bold streaks or spots and their undersides are usually white. One characteristic that separates the green sea turtle from other species of sea turtles is their small rounded head. These turtles can grow to be over 600lbs. Their population is depleting still today and in some areas it is nearly completely extinct. These turtles are over exploited and endangered because they are being hunted. Turtle oil is still used today in some cosmetics products. The skin is used for leather trade and also the shells are very valuable. Years ago, turtles were hunted to feed fishermen. Today, turtle meat is used in a gourmet treat called turtle soup. 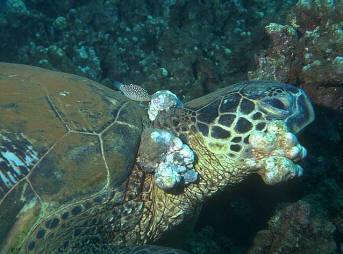 Another threat to the Green Sea Turtle population involves threats to the nest. Predators seek the eggs as a source of nutrients. of multiple tumors on the skin and internal organs.